This book investigates the manner in which the Qur’an and sunna depict female personalities in their narrative literature. Providing a comprehensive study of all the female personalities mentioned in the Qur’an, the book is selective in the personalities of the sunna, examining the three prominent women of ahl al-bayt; Khadija, Fatima, and Zaynab. 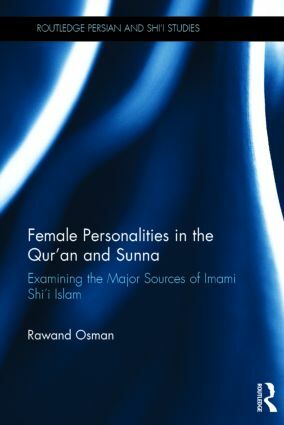 Analysing the major sources of Imami Shi‘i Islam, including the exegetical compilations of the eminent Shi‘i religious authorities of the classical and modern periods, as well as the authoritative books of Shi’i traditions, this book finds that the varieties of female personalities are portrayed as human beings on different stages of the spiritual spectrum. They display feminine qualities, which are often viewed positively and are sometimes commendable traits for men, at least as far as the spiritual domain is concerned. The theory, particularly regarding women’s humanity, is then tested against the depiction of womanhood in the hadith literature, with special emphasis on Nahj al-Balagha. Contributing a fresh perspective on classical materials, this book will be of interest to students and scholars of Islamic Studies, Women’s Studies and Shi’i Studies. "Osman’s work is a significant addition to the growing body of literature on the representation of women in the QurÞan, sunna, and exegetical literature. Its main contribution lies in its focus on ShiÝi exegesis and on the legacies of KhadÐjah, FÁÔimah, and Zaynab in ShiÝi communal memory." Dr Rawand Osman is a researcher in classical Arabic at the University of St. Andrews. She received a BA in History from the American University of Beirut (2003), and an MA and PhD in Islamic Studies from the University of Edinburgh (2005) and the University of Birmingham (2011), respectively. Her research interests include textual analysis of Islamic scripture with emphasis on Shi‘i sources, women’s history, and feminist theology and hermeneutics.